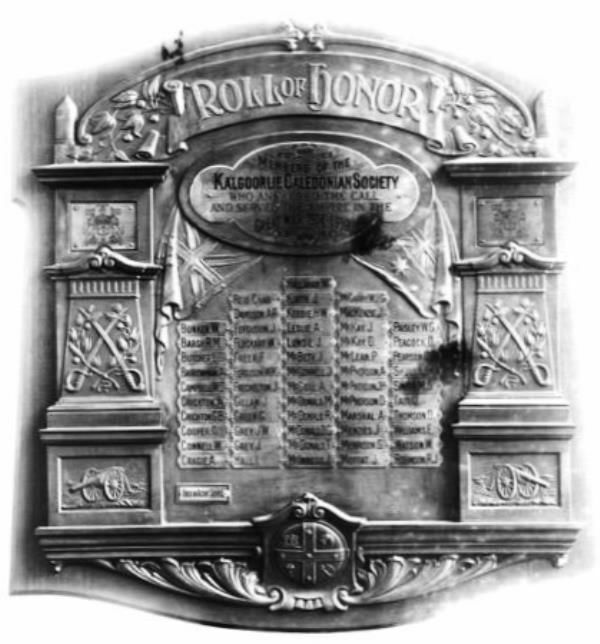 The intricately carved timber honour board with individual engraved metal name plates which commemorates members of the Caledonian Society who served in World War One. The flags of Australia and Britain are carved into the centre of the board with crossed swords over a laurel wreath and a cannon carved on both sides of the board. The honour roll was unveiled by Mr. R.D. McKenzie in the Caledonian Hall on the 1st October 1919. Kalgoorlie Miner, 1st October 1919. Members of the Kalgoorlie Caledonian Society who answered the call and served the Empire in the Great War 1914 - 1919.